The following is a Press Release from Ashbury Precision Ordnance. Ruckersville, VA. – Ashbury Precision Ordnance Mfg‘s Custom Shop (APOCS) was selected by Independent Studio Services, the world’s largest weapons provider to the movie and television production industry, to create a distinctive sniper rifle especially for the new SHOOTER television series premiering on the USA Cable Network November 15, 2016. The new TV series is based on the hit 2007 movie by the same title starring Mark Wahlberg, who is also the new series’s Executive Producer. “The SHOOTER production team did not want a non-functioning Hollywood prop,” said Matthew Peterson, Ashbury’s Product Development Coordinator. “It was important that the sniper rifle used in the TV series had modern, realistic character and be a fully functional ‘real-steel’ precision rifle system. 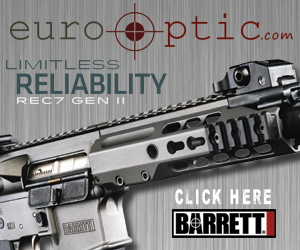 The new signature SHOOTER TV series rifle needed to be based on a ‘commercially available’ factory rifle, built on the innovative SABER®-FORSST® modular rifle chassis system.” APO had just the answer…a SABER Enhanced Factory Rifle – SEFR! The new SHOOTER TV series SEFR rifle built by the APO Custom Shop started out as a Savage 110 with a factory 26″ 1:9 twist barrel chambered for the powerful .338 Lapua Magnum cartridge. The Savage bolt action receiver has been specially trued by the APOCS veteran US Marine Corps MOS 2112/2111 Gunsmithing/Armorer lead ordnance team. The barrel is topped off with a sleek, recoil reducing muzzle brake suppressor adapter. The Savage AccuTrigger is superb and the rifle is easily capable of turning in sub ¾ MOA groups or better, using RUAG Swiss-P 250gr Target OTM ammunition. This real-steel, range-ready APO precision rifle weighs in fully kitted at 18.5lbs! The patented SABER® SVL-A2 MOD-1 is proudly manufactured in the USA by American military veterans and craftsmen from aerospace grade alloys, carbon reinforced composites and high-strength, light-weight carbon fiber. This SABER® modular rifle chassis system features a heat-mitigating prepreg carbon fiber forend with a 30MOA one piece monolithic rail that provides increased structural rigidity essential for consistent down range precision shot placement and solid co-linear mounting of a rifle scope, clip-on night vision or thermal weapon sight. “Through close design collaboration with Independent Studio Services, the current APO SEFR 110 is an enhanced version of the initial SEFR Savage 110 rifle platform Ashbury introduced in late 2012,” said Peterson. “The SABER MOD-1 modular rifle chassis rapidly adjustable ergonomic features and Quattro forend offers the TV series writers and actors a lot to work with in terms of positioning the actor in alternate firing positions and attachment of electro-optic accessories. Ashbury was really pleased to again work with the TV production industry having previously provided APO precision rifles and sniper support gear for television action series like THE UNIT, 24, and Chuck.”The Quattro forend has co-bore aligned Picatinny accessory rail attachment points at 3 and 9 o’clock for laser pointers, illuminators and laser rangefinders. The 6 o’clock forend rail accommodates variable bipod and tripod attachment points. The SVL-A2 MOD-1 has an ergonomically adaptable Push Button Adjustable Hybrid (PBA-H) shoulder stock, drop adjustable Limbsaver® premium recoil pad, height adjustable field monopod, re-positionable hand & grip angle adjustment and a detachable 10rd 3.76” high capacity magazine that accepts CIP length ammunition. For more information about Ashbury Precision Ordnance Mfg., our line of SABER® modular rifle chassis systems, ASW, TCR, SuperSport and SPR precision rifles, APOCS custom pistols and long range shooting accessories, please visit the Ashbury Web Portal. For information on our Riflesports Lifestyles programs visit our APORiflcraft.com and APOExperience.com websites. The Rapid Product Development Center (RPDC) provides engineering design and prototyping services. The engineering services group is Solidworks® CAD based with Simulation FEA and FeatureCam® CAD/CAM machine programming software, 3D Printer-Fused Deposition Modeling (FDM) capable, a modern CNC precision machining shop and an experienced, well trained staff.